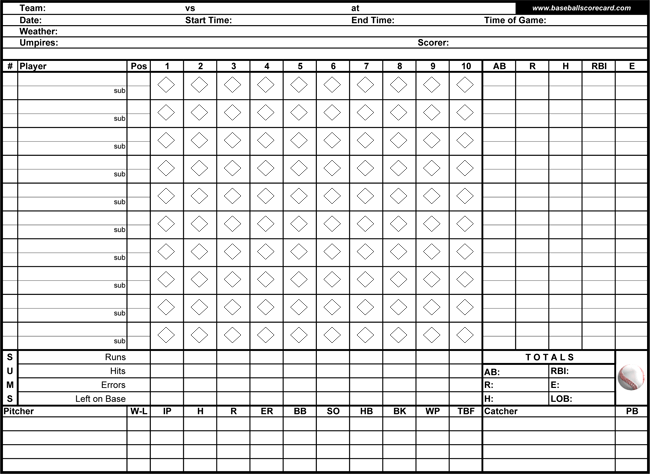 The printable baseball score sheets are used to record the scores of baseball match. They are downloadable score cards that allow you to easily keep track of the game. It’s a fun and engaging tool for baseball fans and even individuals who are learning how the game works. These sheets are also perfect for anyone who likes to study baseball statistics or simply love to take them home as a game memento. 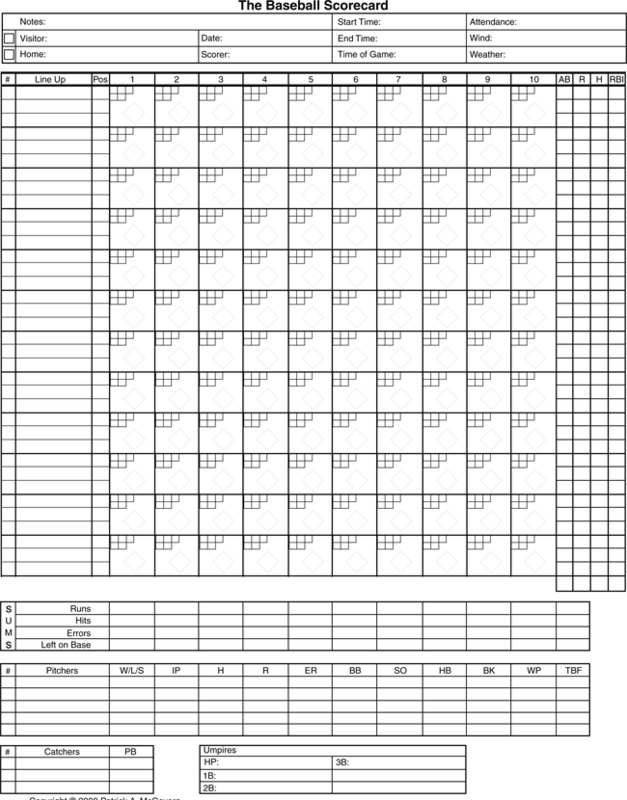 You can utilize these sheets to record hits, runs, and other player activities for both the home and away team – one sheet for each team. You’ll start off by labeling the left hand side with names, jersey numbers and positions numbers (for the more advanced scorekeepers). Learning the code for player activities can also be helpful, such as K for strikeouts and BB for walks. Once you’ve learned these codes, the next step is paying attention to the game. Here are some beginner pointers to keep in mind when starting off as new scorekeeper. If a batter hits a double, put in 2B outside of the diamond and darken the lines leading to 2nd base on your diamond. If a batter is walked, put a BB in the middle of the diamond. If a player is the first one to be out in that inning, you can put a “1” with a circle around it. These downloads allow you to keep track of every important detail of the game so you don’t miss anything. They’re easy to use and you don’t have to worry about losing cellphone signal during a game and miss what’s going on. It’s perfect for getting all of the friends and family members involved in the game. Each printable baseball score sheet is a story on its own, and they’ll serve as wonderful memories for years to come. 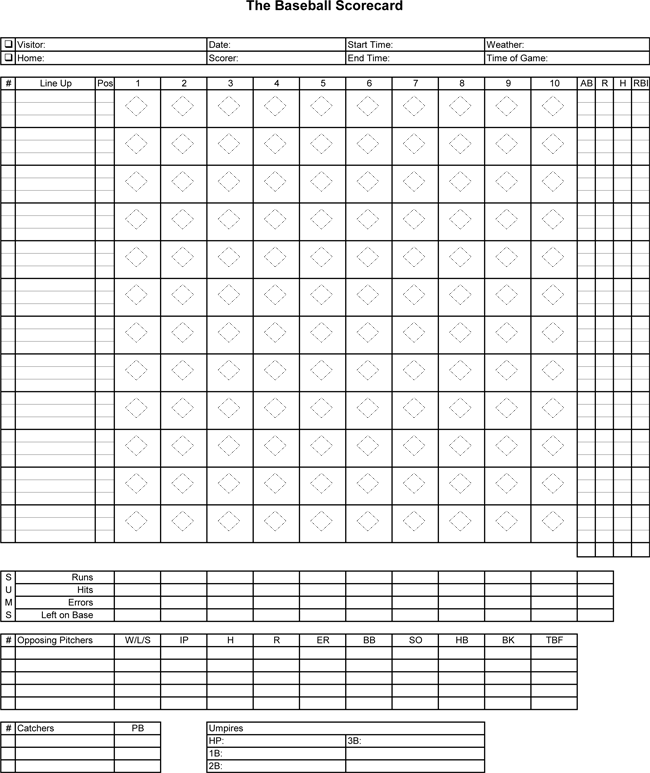 Download our printable baseball score sheets today.